Groan. My coworker said that to me and giggled about it for the rest of the afternoon, but he was onto something. I’ve written before about crafts and their benefits, and it’s something we have to keep learning over and over. Crafts bring pleasure but, more importantly, they bring us into the moment. That class looming over me for the day reminded me that my life isn’t all about my day job. I take weaving classes at the Chicago Weaving School with Natalie Boyett. An amazing teacher, Natalie understands the Zen of art. She knows how to be gentle and she knows how to inspire. 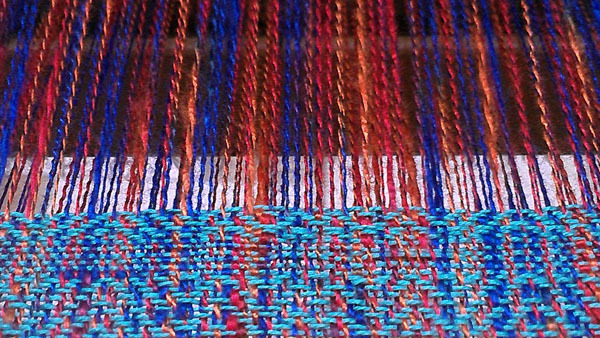 More than that, I find weaving puts me in the moment and while I’m working on the simple back-and-forth or counting, my mind relaxes. From there, it’s an easy jump into my story. 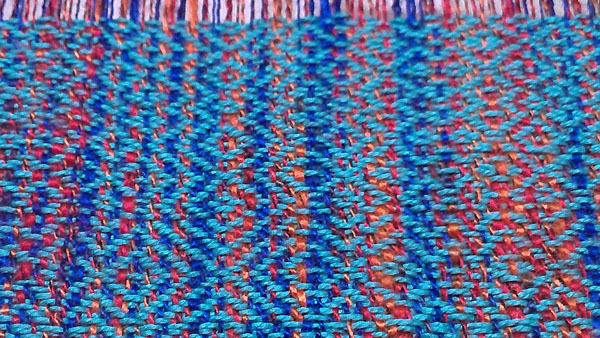 Weaving makes me a better writer. I’m sure it has that beneficial effect on other walks of life too; my classes are full of teachers, nurses, and professionals of all stripes. We come because weaving is fun. We stay because it’s a way of life. Too melodramatic for you? To New Age? Let me share with you the magic and you’ll see what I’m talking about. My project is a simple kimono. The ancient art of kimono, developed in Japan over centuries, is a way of making clothes that shows off hand-woven fabrics. From simple to ornate, they require little cutting or shaping and are a perfect way to use the product of our handweaving. I decided to use a pattern from a classic weaving book. A variation on a twill, it requires you to thread the heddles (put the yarn on the loom) in a certain order. The process of doing so is mechanical and not very artistic: put this thread in 1, this one in 3, that one in 2, then 4-3-1, then 2-1-4, or some other order. It’s painstaking and detailed. It is, though, one half of the process of weaving. Once you’ve dressed the loom, you’re halfway done. Magic. Once the loom is dressed, we weave a header to even out the threads and set the stage for our pattern. I’m using a lovely but fussy rayon thread for my warp, which is the red/blue in the photograph. My weft, the yarn I use to weave, is a rich teal. After the header, we start with the pattern. This, too, is done in a particular order. The difference is that now we begin to see the magic that is weaving. It looks like the thread is almost beaded, as the rayon shines like fire in the light. I can’t wait to see more of the fabric as it appears. It’s meditative. I look forward to my Thursday night classes all week, because I know I’ll get to spend four hours away from the world, in my little magic bubble of fiber. When I emerge, butterfly-like, it’s with a renewed appreciation for the art of our ancestresses and not a few plot ideas. As I weave, so shall I write. And that, my friends, is the magic of craft.